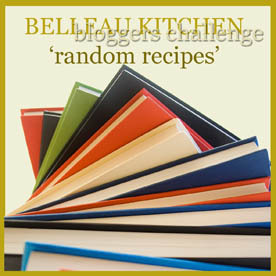 But here I am scraping in by the skin of my teeth again to enter the Random Recipe Challenge for June hosted by Dom at Belleau Kitchen. Still, as I have the kitchen to myself tonight, which doesn't happen all that often I thought I would treat myself to some rice pudding and shoot it off to Belleau Kitchen. 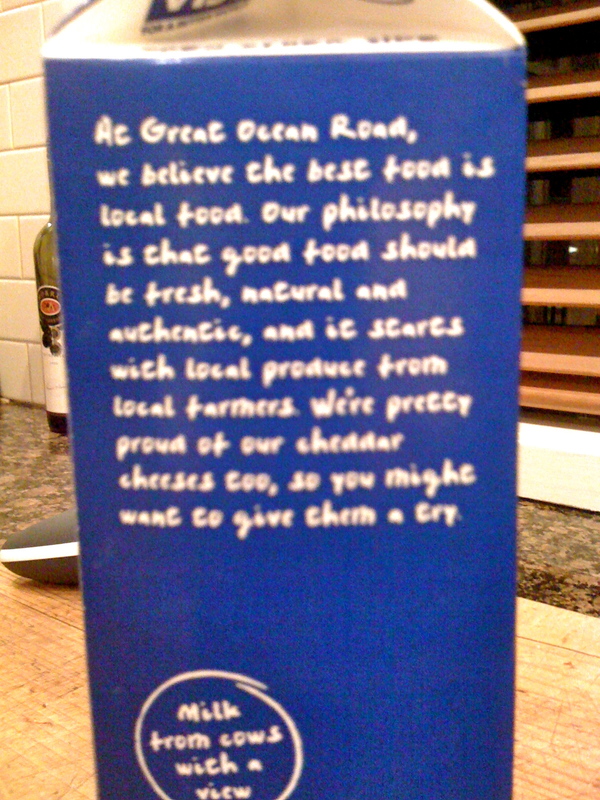 This is such comfort food (which the man calls Depression Food as in Post War Food). And to add to the sixth sense of it all, this is what I ordered the last time I visited the Oliver family pub (with my sister and very best friend) for lunch at "The Cricketers Arms" in Clavering, Essex back in 2008 when I bought this book - it still has the receipt from lunch tucked in the front. Don't you love it when little pieces of story all seem to fit together. This serves 6 to 8 its easy to cook and no bother to prepare. Place milk rice and sugar in a deep saucepan. Bring to a medium simmer and put the lid on. Cook for half an hour, stirring occasionally until it is thick and creamy. 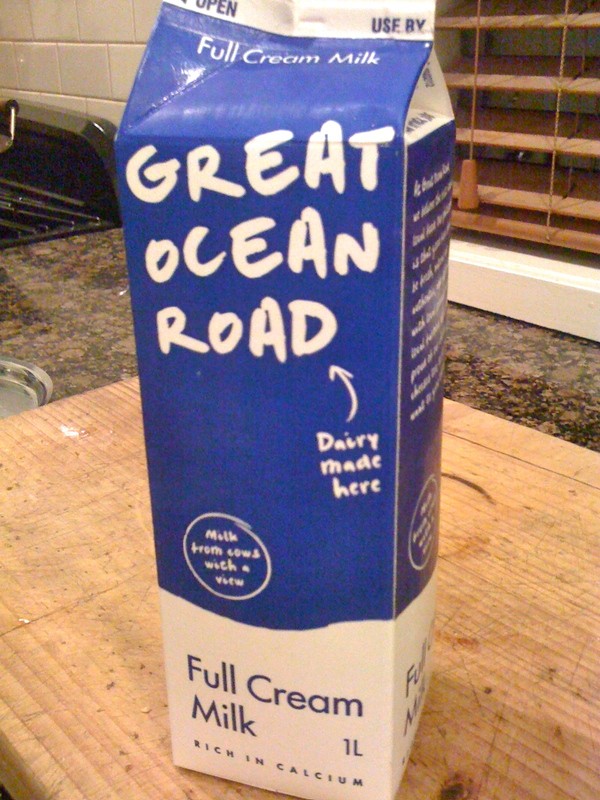 Add a drop more milk if it gets too thick. 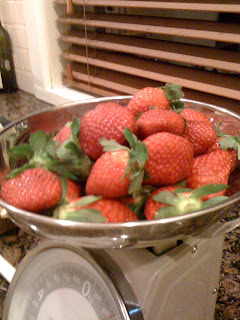 Place strawberries in a wide, stainless steel pan and sprinkle with the sugar. Scrunch the strawberries up with your hands, really pushing them between your fingers to pulp the mixture, which will start to look like jam. This felt amazingly good! And I licked every finger! It was a wonder it made it to jam - cos it was good enough to eat straight from the pot. Make sure the sugar has dissolved into the strawberry juice before you bring it to the boil. Every 5 mins or so skim off the foam and then it is done - perfect. 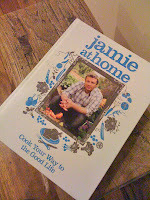 Jamie scrunched some meringues over the top of his to serve, but mine was pretty good without any topping. So good in fact I nearly burnt my tongue on the swirl of hot jam as I couldn't wait for it to cool to taste it. There was plenty left - jam into jars for the future and rice for breakfast in the morning. Spiders didn't really hit the spot but this rice pudding on the next page - that was another story. As we get older I find our tastes change? Although the man has yet converted to rice pudding or liver! Both of which I love. Love taking part in the challenge even if I do leave it till the last minute and love reading your blog. I like the way we all get creative. Rice pudding is just my all time favorite and like you I keep experimenting by adding different flavors to it. 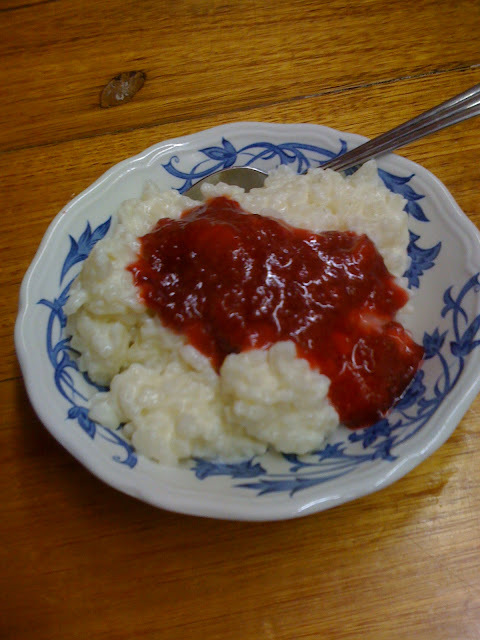 Love your strawberry jam on top of rice pudding. I think we all need a little challenge to bring out the best in us. Thank you for your lovely comments. 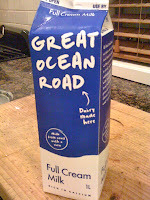 The strawberry jam sounds super, I'll definitely have a go t that, but it's a tad too hot for rice pudding t the moment! This jam took such little time (or heat) that I am sure you could suffer that even if you don't get to the pudding. Mind you I like rice pudding cold too! I am so glad sometimes that I am the only one in the house that likes some food which means there is more for me!!! the jam won't last long though. I ate the whole lot myself! How terrible is that! 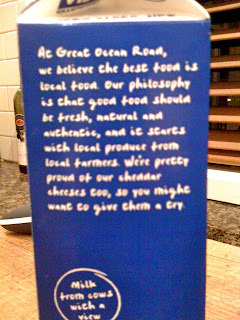 It was lovely though. Saw this on Dom's Roundup for this month and thought "I don't remember seeing this" - so clicked on to your blog and saw the reason why! Left it to the last minute again!! Still, it was worth it - and lovely to be reminded of a lovely day we had back in 2008 - can hardly believe it was 4 years ago, but then I suppose it must be!! Yes I seem to be rushing from one thing to another lately, but I just scraped in with this one. I think I had it with rhubarb that day at lunch. It was such a lovely lunch and Sandra not being able to remember if she had made rice pudding or not! Poor thing. 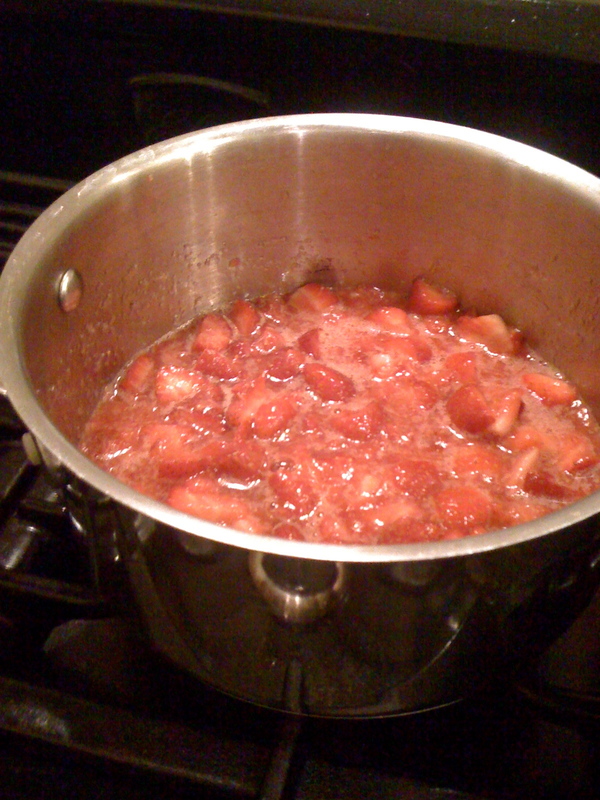 Oh and don't forget that strawberry jam that is really worth trying. So nice of you to comment Debby. Karen thanks for commenting - this was so yummy I am making it again this week - have to use my jam up. Rice pudding is absolutely the best - and the jam looks wonderful - LOVE this! Mary I so agree - nice to see you come by. I think that chilled cucumber or chamomile tea bags are really good too. Hope your itchy eyes soon get better. Thanks Debby will give it a shot!